Any doubts surrounding Tom Herman’s ability to recruit with the elite programs in the nation for the top talent in Texas were answered during the 2018 recruiting class despite the product on the field taking minimal steps forward. A year after finishing with the 25th ranked class in the nation in his first crack at Texas, Herman’s program will ink a top-5 class come Feb. 7. The main reason is the defensive backs that Herman, defensive coordinator Todd Orlando and assistant coach Jason Washington signed during the early period. Texas managed to sign the top three safeties and cornerbacks in the state, including the lone 5-star in Texas — BJ Foster. Foster, a native of Angleton, led the charge of assembling the best players in the state. At safety, he’ll be joined by Caden Sterns and DeMarvion Overshown. 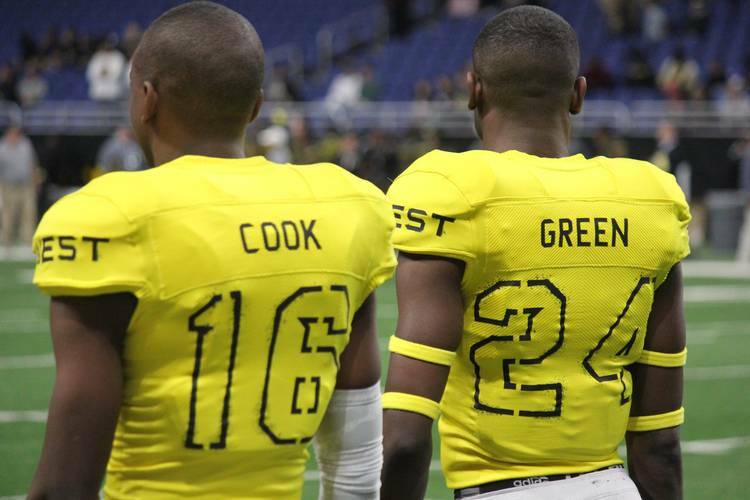 The cornerback class includes 4-stars Anthony Cook, D’Shawn Jamison and Jalen Green. Foster committed in June, causing a domino effect for other members of the class. Sterns and Overshown joined over the summer, as did Green. Jamison picked Texas immediately following the Red River rivalry game. Cook was the final piece, choosing the Longhorns over LSU and Ohio State live on ESPN. Texas lost starting cornerback Holton Hill and starting safety DeShon Elliott to the NFL draft, leaving open spots for the true freshmen to compete for snaps. Sterns, Foster and Cook will enroll early at Texas, participate in the offseason drills and compete during spring practice. The narrative may be overblown but it is true that the Big 12 is pass-happy. The amount of spread offenses around the conference make it an attractive spot for offensive skill players. It also helped Texas lure the best six defensive backs in the state. There will be plenty of action for all six of the signees, and that’s what they wanted. The challenge of signing so many star players in one position group is convincing them enough playing time exists for all involved. None of these guys plan on sitting on the sideline and a few of them would’ve gone elsewhere if the possibility of immediate playing time, and the right defensive scheme, weren’t available at Texas. The NFL is the goal for 99 percent of elite prospects on the recruiting trail. Winning championships also plays into the equation, as does tradition. These players say their first memories of Texas football were of Vince Young winning championships. It was also a time when the Longhorns were the unquestioned DBU. Defensive Back University can now be claimed by LSU, something the 2018 signees want to rectify. Texas is still Texas, even if the recent record doesn’t reflect dominance. The name still rings bells for teenagers, especially with the renewed energy brought into the program by Herman and his staff.